The Yellow Line shutdown map. Click to enlarge. Metro's Yellow Line falls off the map for two weeks starting the Monday after Thanksgiving as the transit agency shuts down the bridge over the Potomac River for repairs. 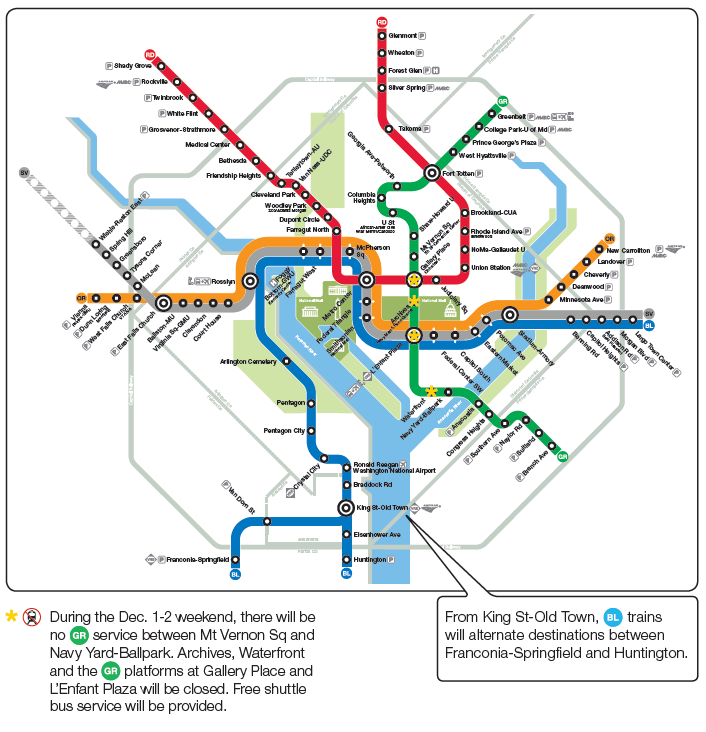 WASHINGTON — Metro’s Yellow Line falls off the map for two weeks starting the Monday after Thanksgiving (Nov. 26) as the transit agency shuts down the bridge over the Potomac River for repairs. The work is scheduled to cut rush-hour rail service in half at all Blue and Yellow Line stations in Virginia from Pentagon to Franconia-Springfield and Huntington, and in the District at Yellow and Green Line stations between L’Enfant Plaza and Mt. Vernon Square. Metro plans to run every other normally scheduled rush hour Blue Line train from Huntington rather than Franconia-Springfield at rush hour, providing trains every 16 minutes from each endpoint. From King Street to Largo Town Center, there should be a normal number of Blue Line trains, but they could be more crowded than usual since there will be no Yellow Line service. All rail stations will be open during the structural and rail repair work on the Yellow Line bridge. The Red, Green, Orange and Silver Lines are scheduled to run as usual on weekdays. This follows the Veterans Day weekend four-day shutdown of the Blue and Yellow Lines through Reagan National Airport. Alternatives include free Metrobus express shuttle service between Franconia-Springfield and Pentagon, and between Pentagon and L’Enfant Plaza, each weekday until 8 p.m.
During rush hour only, Metro also plans to offer express shuttle buses between Franconia-Springfield and L’Enfant Plaza, and between Crystal City and L’Enfant Plaza. Virginia Railway Express (VRE) is another option with stops at Franconia-Springfield, Alexandria, Crystal City, L’Enfant Plaza and Union Station. The rail service largely operates toward D.C. in the morning and out into Virginia in the afternoon. It only operates on weekdays. For some Metro riders, existing Metrobus routes may also provide alternatives like Metroway between Alexandria and Arlington, the 10A Huntington-Braddock Rd.-Old Town-Pentagon, 10B Hunting Point-Braddock Rd-Ballston, 11Y Mt. Vernon-Old Town-Farragut Sq., or 16C Culmore-Pentagon-Federal Triangle. Fairfax Connector, Alexandria’s DASH and Arlington’s ART buses or commuter buses like PRTC OmniRide are also options. They are each running regular service during this shutdown. 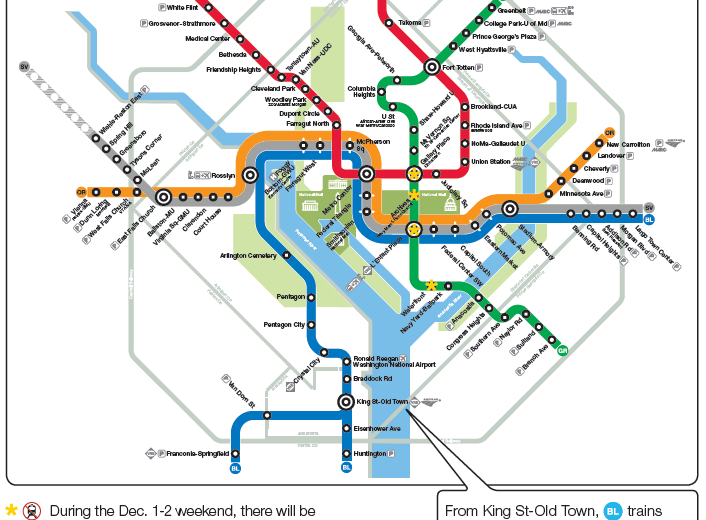 On the first weekend of the work, Dec. 1-2, Metro plans to also shut down five Green Line stations. On Saturday and Sunday, Navy Yard, Waterfront and Archives will be closed, along with the Yellow and Green Line platforms only at Gallery Place-Chinatown and L’Enfant Plaza. Green Line riders using those stations will be served by shuttle buses only. Both weekends of the Yellow Line bridge shutdown, there will be no additional shuttle buses in Virginia. Blue Line trains will be scheduled every 16 to 20 minutes to and from both Huntington and Franconia-Springfield.